Polls open later in what is proving to be one of the most divisive US midterm elections for decades. 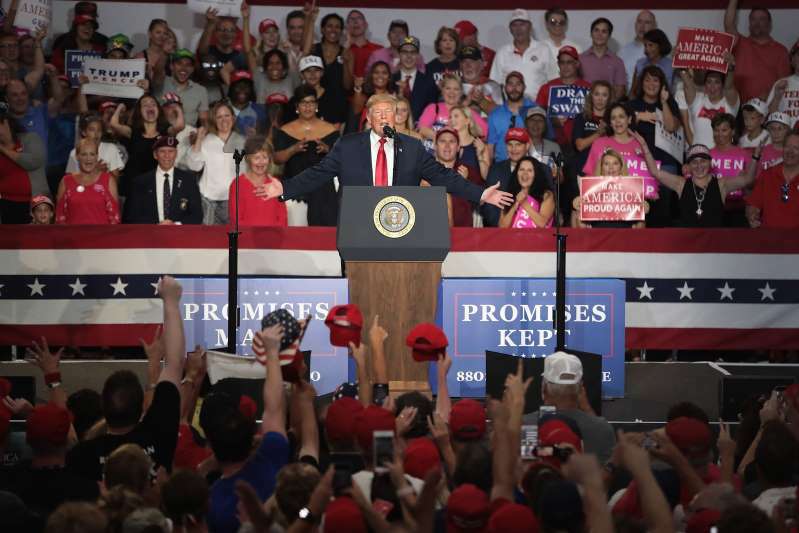 Donald Trump has been campaigning up to the last minute, addressing rally after rally and urging supporters to vote, saying the media would treat the results as a referendum on his presidency. "Even though I'm not on the ballot, in a certain way I am on the ballot," he said. "The press is very much considering it a referendum on me and us as a movement." He made the comments before a three-state rally blitz in a final push to keep Congress in Republican hands and prevent any potential losses that could change the course of his presidency. President Trump repeatedly claimed a Democratic takeover would throw the US into chaos, sparking a wave of illegal immigration and crime. In Fort Wayne, Indiana, he said Democrats would take a "wrecking ball to our economy and to the future of our country" and that they would oversee "a socialist nightmare". Protesters interrupted the billionaire multiple times at the rally as they chanted against Mr Trump. They were soon drowned out by the president's supporters. Mr Trump told one demonstrator to "go home to mommy". He reminded supporters to help preserve "fragile" Republican victories that could be wiped out by Democratic gains in Congress. "It's all fragile. Everything I told you about, it can be undone and changed by the Democrats if they get in," Mr Trump told supporters on a telephone town hall meeting held by his re-election campaign. "You see how they've behaved. You see what's happening with them. They've really become radicalised." The US leader has already looked to distance himself from any potential blame if Republicans lose the House of Representatives, saying: "My primary focus has been on the Senate." 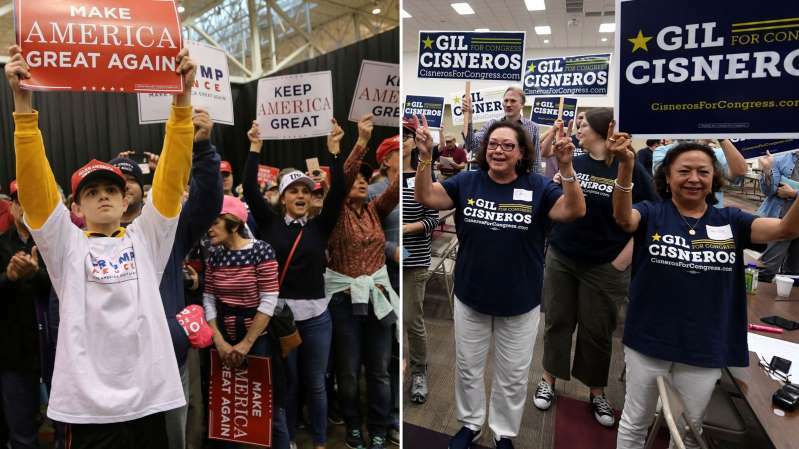 In the lead up to the elections, President Trump has been to 11 rallies in six days, and has notably issued personal attacks on several political rivals. House minority leader Nancy Pelosi, Senate minority leader Chuck Schumer and representative Maxine Waters regularly featured in his closing messages as he argued Democrats would plunge the country into chaos. However, in a TV interview on Monday, the US leader said he wished he had taken a softer tone in his first two years as president. He told Sinclair Broadcasting: "I would like to have a much softer tone... I feel to a certain extent I have no choice, but maybe I do and maybe I could have been softer from that standpoint." 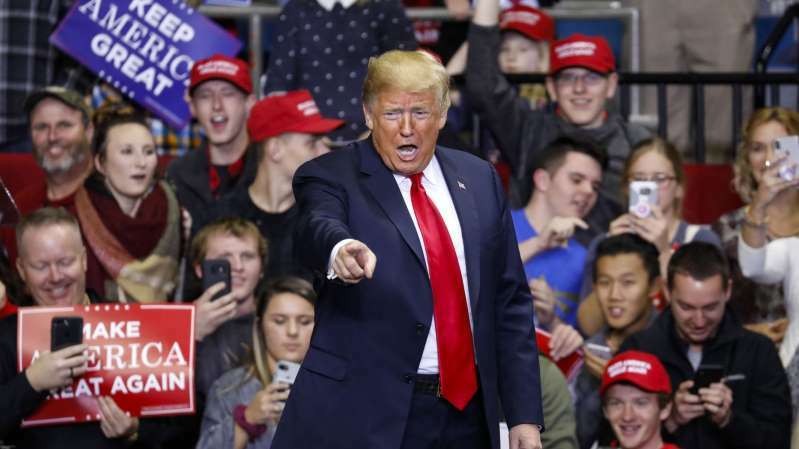 But there was little softening in tone as he attended rallies in Ohio, Indiana and Missouri, where his hard-line rhetoric on immigration remained. The ramped up rhetoric comes as Mr Trump's campaign advert featuring an immigrant convicted of killing two police officers was taken off Facebook, NBC and Fox News. CNN already rejected the advert, claiming it was racist. When asked if he thought the advert was racist as he left for the rallies, the president said: "A lot of things are offensive. Your questions are offensive a lot of times." Meanwhile, former president Barack Obama delivered doughnuts to Democratic campaign volunteers in a House district in Virginia, where candidate Jennifer Wexton is challenging Republican Barbara Comstock. Mr Obama said America's character and commitment to decency were on the ballot. "All across the country, what I'm seeing is a great awakening," he said. "People woke up and said: 'Oh, we can't take this for granted. We've got to fight for this.'" He added: "You're going out there, you're going to make sure that people vote to start making things better. "And when you do that, then the spirit of America is going to shine. Alright? Let's get to work." 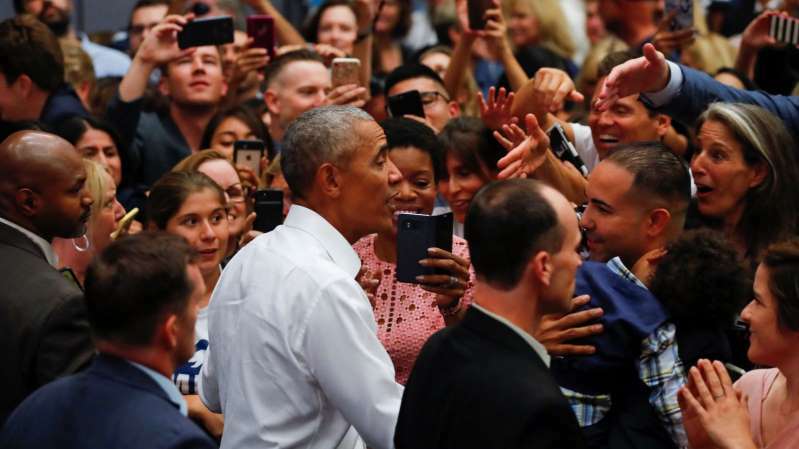 At a rally on Sunday, without naming the current US leader, Mr Obama condemned him and Republicans for what he described as divisive policies. He also accused Mr Trump of lying and "fear-mongering", warning Democrats not to get distracted. Elsewhere, Facebook blocked 30 accounts and 85 Instagram accounts in its efforts to stop interference online during the elections. It said authorities discovered online activity "linked to foreign entities" and that it was investigating the accounts. :: Live coverage of the US midterm elections on Sky News from 11pm on Tuesday with Adam Boulton live in Washington and our breaking results service on skynews.com and app, plus expert analysis from breakfast on Wednesday.